“Building back better” to create more resilient societies is a laudable goal, but every country is different and there are no quick fixes. By taking into account topographical differences, reforming building codes, and reviving ecosystems, the Caribbean can take a significant step in the right direction, write Emily Wilkinson and Rachael Steller (Overseas Development Institute). In Dominica, 80 per cent of all buildings were damaged during Hurricane Maria in 2017, either by high winds or by the debris-strewn waters churning through the island’s 365 rivers. Roofs were ripped off, and some 23,488 houses were damaged or destroyed. The International Monetary Fund has estimated that average annual hurricane damage in the Caribbean could increase by anywhere between 22 and 77 per cent by 2100. There is clearly something wrong with the way houses are built in Dominica and across the Caribbean, particularly given the likelihood of more high-intensity storms in the future. Changing building practices is just one a number of development problems that need to be addressed. But there currently exist both the opportunity and the political commitment to “build back better” after the 2017 hurricanes. One of the key challenges facing many small islands is their relatively high exposure to hazards. Coasts are highly exposed to tropical storms, tsunamis, coastal erosion, and rising sea levels. Worse still, on small islands a high proportion of people and assets are located along these vulnerable coastlines. At 100 per cent, the Maldives naturally has the highest proportion of people living in low-lying coastal areas, with the Bahamas in second place at 88 per cent, followed closely by other Caribbean and Pacific islands. But reducing exposure to hazards is costly – often prohibitively so for small island developing states (SIDS). Caribbean islands in particular face high debt-to-GDP ratios, and those moving out of the category of low- and middle-income countries also lose access to Overseas Development Assistance (ODA), which further limits access to finance for recovery. Given the severe impact of disasters on these island economies, there have been calls to reconsider the aid rules for SIDS. Disaster risk in the Caribbean has deep roots: from settlement patterns on marginal, unsafe land driven by slavery and plantation development to economies reliant on (monocrop) agriculture and under-investment in road infrastructure. Though many of these colonial legacies are shared, similarities between islands should not be overstated. Each has its own history, geography, climate, and economy, and there is no one-size-fits all approach to reducing risk. One important difference relates to the topography of the islands (see figure 1, below). Dominica and Saint Vincent, for example, are volcanic islands with steep, unstable slopes which make resilient construction more challenging. This heterogeneity presents a further challenge to building back better: despite the obvious advantages of sharing knowledge and skills across the region, what works in one country may not work in another. Aside from the problem of where to build back better, there is also is the question of how to rebuild in a way that will minimise damage in the future. Most people rebuild their own houses using their own resources, with less than 30 per cent of those affected receiving international aid for reconstruction. Most governments, including in Antigua and Barbuda, consider the post-disaster reconstruction of homes to be the responsibility of homeowners. Despite the enormous challenges involved, many of the islands most affected by tropical storms are taking important steps to prepare better for the future. Antigua and Barbuda, Dominica, the Dominican Republic, Haiti, Saint Lucia, Saint Vincent and the Grenadines, and Cuba are all working to improve their early warning systems so that they can act in advance of hazards and save lives. But to reduce the risks to property and other assets, greater consideration needs to be given to building practices. Dominica recently revised its housing standards to promote steeper roof pitches and the use of hurricane clips. But the problem is not so much the standards as the difficulties people have in complying with them. According to the Director of the National Office of Disaster Services in Antigua and Barbuda, many buildings constructed before the 2017 hurricanes often did not meet code requirements. Most construction in the Caribbean is informal. In Jamaica 70 per cent of buildings were not regulated at all. Building codes and guidelines tend to be overly complicated and poor families simply can’t afford to make their houses safe from hurricanes, earthquakes, and fires. Jamaica is trying to address the problem of informal housing through its new Building Act. The Act creates a new category of “building practitioner”. These are non-professionals with vocational training who would be legally allowed to construct small buildings. With enough trained building practitioners, “building back better” might at last become more plausible than aspirational. As well as improving building safety, there is a growing interest across the Caribbean in rebuilding ecosystems. 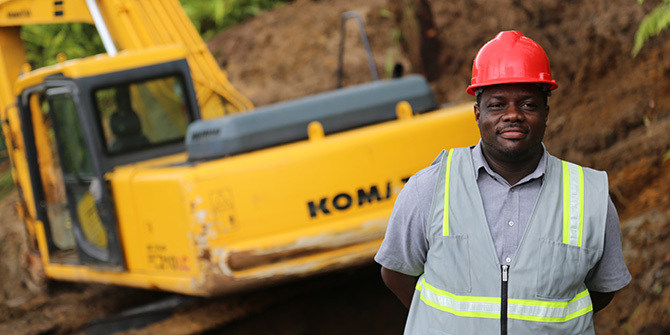 Indeed, Dominica’s recovery strategy includes a focus on rebuilding environmental assets such as coral reefs, forests, and mangroves in order to help its tourism and agricultural sectors to recover. Yet this co-called “blue and green” infrastructure can also provide important protection from hurricanes. This kind of investment is critical for the future resilience of these vulnerable islands. Ultimately, building back better will require a focus on the inclusion of poor and vulnerable groups as well as sustained efforts to make best use of available resources whilst at the same time protecting them. Caribbean governments will also need to address risks whose root causes stretch far back into the past. When it comes to the creation of more resilient societies, there is simply no quick fix. This is a laudable and achievable goal, but it is also a long-term endeavour. Building back better may only be a first step, but it is a step in the right direction. Emily Wilkinson is a Senior Research Fellow in the ODI Risk and Resilience Programme. Her research focuses on effectiveness and accountability in disaster risk reduction and recovery. She has a PhD in Human Geography from UCL and has published over 50 articles, book chapters, and blogs on climate and disaster risk management. Rachael Steller is an intern in the Overseas Development Institute’s Risk and Resilience programme. She recently completed a Master’s in Public International Law at the London School of Economics and Political Science, during which she conducted research on transnational legal frameworks for disaster risk management and public participation in DRM decision-making. Before completing her Master’s she practised environmental law in New Zealand. Thanks to the authors for an excellent article. The examples of country initiatives illustrate the constraints in disaster risk reduction planning in the Caribbean, in which it is difficult to establish and maintain a coherent management framework that incorporates appropriate policies, economic interventions (public sector and private financial institutions), environmental safeguards, and individual and institutional capacities. Additionally, engaging, resourcing, and mobilising the three social sectors towards long-term sustainable development goals is demanding, even with the demonstrated vulnerabilities to climate change and natural disasters. I hope we will hear more from the authors as they continue their research and work in the area of disaster risk management.